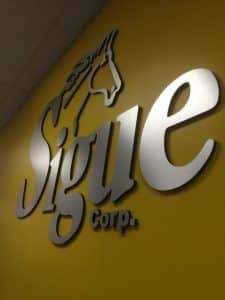 Sigue Corporation is a money transfer service company with multiple locations in just Los Angeles alone. 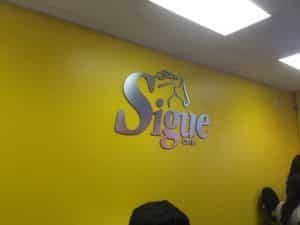 They have an office in East Los Angeles that they wanted to get an interior logo sign for. 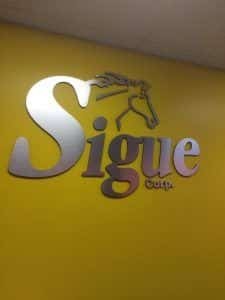 Prior to working on the East Los Angeles office, they had initially reached out to us for their Sylmar office where we made them an interior sign and an exterior sign. Because of this, we already had their logo file and knew what they wanted their sign to look like. As you can see from the photos, this sign has a metallic look. However, this was not always the sign design. These are acrylic letters with metal laminate on the faces. We started with 1/2″ thick black acrylic that was laminated with brushed aluminum. The logo was routed from the acrylic with metal laminate to create the 3-dimensional logo sign.